Rhodium is a transition metal with high resistance to corrosion. It is a member of the platinum group, and mainly used to harden alloys of platinum and palladium. It is also used in automobile catalytic converters. Rhodium is found often in types of jewelry, giving it a silvery-white appearance. It can be used to coat sterling silver, to prevent tarnishing from the build up of silver sulfide. 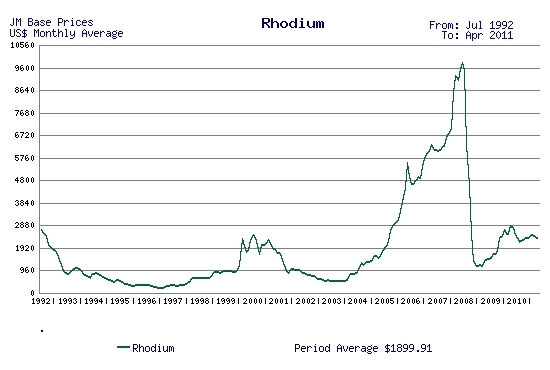 Global rhodium consumption in 2009 decreased to 22,300 kg, a 20% decrease compared with that of 2008. A majority of rhodium use, 82% in 2009, was in the production of autocatalysts. In 2009, rhodium use in autocatalysts decreased to 19,300 kg, which was 19% less than that of 2008. Demand for rhodium in the autocatalyst sector plummeted in Europe, Japan, and North America, as a result of declining vehicle production, a trend toward smaller vehicles, and rhodium thrifting. In contrast, rhodium demand in the autocatalyst sector in China increased to 3,640 kg, an increase of 52% compared with that of 2008. Anglo American (LON: AAL) - http://www.angloamerican.co.uk/ourbusiness/thebusinesses/platinum/ - Their Anglo Platinum subsidiary specializes in all the platinum group elements, including rhodium. Anooraq Resources Corporation (AMEX: ANO) - Their Plateau Resources subsidiary produces platinum group metals through their Ga-Phasha, Boikgantsho, and Kwanda projects in South Africa. North American Palladium (AMEX: PAL) - http://www.napalladium.com/ - Canada's largest producer of palladium, they also produce platinum group metals as a byproduct. 2010-01-02 - (kit) - Rhodium predictions and is now a time to invest? 2009-01-07 - (sp) - When you buy, invest or trade rhodium - Watch the spreads! 2008-06-23 - (kit) - Anyone know how to invest/buy rhodium?